In the faraway kingdom of Dor lived a brave and virtuous mouse with comically oversized ears who dreamt of becoming a knight. Banished from his home for having such lofty ambitions, Despereaux sets off on an amazing adventure with his good-hearted rat friend Roscuro, who leads him, at long last, on a very noble quest to rescue an endangered princess and save an entire kingdom from darkness. $10.103 million on 2758 screens. Not that long ago, only Disney’s animated films managed to produce at the box office. DreamWorks eventually busted that monopoly in the early 2000s, and Fox has produced hits like the Ice Age series and Horton Hears a Who. To date, other studios haven’t been able to find much animated success, however. Today’s latest victim: 2008’s The Tale of Despereaux, which only mustered a lackluster $50 million take despite a prime holiday season release date. The film takes us to the kingdom of Dor, a land obsessed with soup. 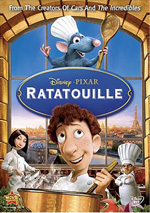 At the start of every spring, Chef Andre (voiced by Kevin Kline) creates a special new concoction, and a visiting rat named Roscuro (Dustin Hoffman) finds himself in town during the annual soup festival. In his quest to get some of Andre’s delightful new broth, Roscuro finds himself in the royal dining room, and he accidentally falls into the queen’s (Patricia Cullen) bowl while she eats. The sight of a rat in her soup literally shocks the queen to death. In the wake of this tragedy, Roscuro ends up living in the sewers with the other rats, while the king bans both soup and rodents. A pallor swallows the town. In the midst of this gloom, a mouse named Despereaux (Matthew Broderick) comes into the world. From the very start, he seems different than the other mice. Not only does he possess enormous ears, but also he doesn’t scurry, cower or show fear like the rest of the mice. Though mice are supposed to eat the books in the royal library, Despereaux prefers to read them, and he takes to a tale of knights. He eventually meets Princess Pea (Emma Watson) and becomes enchanted by her. He describes himself as a gentleman and aspires to become a knight. This leads him to banishment to Rat World but sends him on a journey that intersects with Roscuro and others. At its start, I feared that Despereaux would flail us with its theme from beginning to end. When the flick introduces Roscuro, it immediately sets up the notion that we shouldn’t follow preconceived notions of what people – or animals – should or shouldn’t be. We’re told that rats hate people and the light, but we see that Roscuro loves both. Of course, we get many comments about the fact that mice are supposed to be timid and afraid so Despereaux can come out as something different. At no point does the film veer away from its “believe in your dreams” hypothesis; it reminds us of that concept on a nearly constant basis. Usually that would make the movie irritating and one-note, but Despereaux actually manages to entertain despite the potential pitfalls. 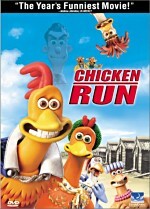 The film’s dark tone helps counteract its theoretical gloppiness. And dark Despereaux is, much rougher than the average “kiddie” flick. 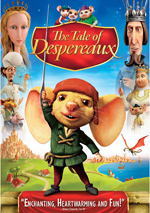 The movie’s trailer gave Despereaux a cutesy feel that emphasized the big-eared mouse who wants to be a knight. That’s also what the DVD’s art touts. It’s all bright colors and smiling characters, virtually none of which you’ll see in the actual film. I’m sure this means families who showed up at theaters for Despereaux left shocked at the film’s relentlessly grim outlook. Yes, it comes with the requisite happy ending. Yes, it teaches lessons along the way. Nonetheless, feelings of sadness and bitterness permeate the story, and we get many moments of cruelty. Not exactly happy family fare, huh? Which is perfectly fine with me, as this allows Despereaux to stand out as something different – and something generally successful, though not wholly winning. Just being an alternative to the standard fare doesn’t mean Despereaux automatically becomes a classic. It’s most definitely not a classic, and it does suffer from shortcomings. The story feels awfully episodic and disjointed at times. It all comes together eventually, but not in a particularly smooth or concise way. The relentless exposition of the film’s themes doesn’t help, as they give the movie something of a pedantic feel. The narration tends to nag us more than it informs us. Awkward as the storytelling may be, at least Despereaux tells a creative narrative. It joins humans and rodents in an unusual manner and manages to turn into something involving. The characters also become more three-dimensional than usual. Yes, Despereaux doesn’t really develop; he remains plucky and courageous from start to finish. The others take more interesting journeys, though, and they’re allowed to show layers of personality. Though the movie’s dour nature makes it a more difficult sell for families, that chilly tone is what allows Despereaux to become interesting. It’s not a one-trick pony, however; while the downbeat nature of the tale is unusual, the film picks up the slack in other ways to become involving. This is a quirky and enjoyable flick. 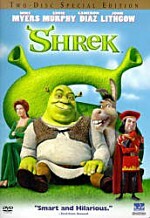 The Tale of Despereaux appears in an aspect ratio of approximately 2.35:1 on this single-sided, double-layered DVD; the image has been enhanced for 16X9 televisions. Expect very few problems during this strong transfer. Sharpness looked terrific. Only a hint of softness emerged here, as the movie almost always seemed concise and well-defined. I noticed no issues connected to shimmering or jagged edges, and just a smidgen of edge enhancement materialized. Of course, the computer-animated affair came without source flaws, so don’t worry about any specks, marks or other defects. Expect a fairly nostalgic golden tint to the palette. Within those constraints, the colors looked quite good. They remained warm and rich throughout the movie. Blacks were concise and dark, and shadows seemed clear and well-defined. Overall, Despereaux provided terrific visuals. Though not as memorable, the Dolby Digital 5.1 soundtrack of Despereaux seemed positive. In the forward domain, the music showed fine stereo imaging, while effects blended together neatly and smoothly. Those elements moved from speaker to speaker cleanly as the track created a solid sense of atmosphere. It even included a fair amount of dialogue from the side speakers, which offered a good impression of breadth. Surround usage generally favored reinforcement of music and effects, but the rears came to life during a number of scenes. Various action bits showed effective use of the surrounds on occasion. The mix helped bring the material to life. Audio quality consistently seemed positive. Dialogue was natural and distinct, and I heard no problems related to intelligibility or edginess. Music was rich and warm throughout the movie, with good clarity as well. Bass was a bit of a weak link, as the flick didn’t boast particularly dynamic low-end; the mix didn’t seem feeble, but it could’ve used stronger depth. This was an acceptably engaging soundtrack that earned a “B“. Among the disc’s smattering of supplements, we find two featurettes. The Tale of The Tale of Despereaux: A (Mostly) Non-Fictional Making Of goes for 11 minutes, 41 seconds and includes notes from author Kate DiCamillo, screenwriter/producer Gary Ross, producer Allison Thomas, co-directors Sam Fell and Rob Stevenhagen, supervising animator Gabriele Zucchelli, director of photography Brad Blackbourn, production designer Evgeni Tomov, lead digital matte painter Jason Horley, head of lighting Ryan Michero, and actors Stanley Tucci, Emma Watson, Matthew Broderick, and Kevin Kline. We get some notes about the source novel and its adaptation, cast and performances, planning and storyboarding, visual design and animation issues. Expect a decent overview of the production from “Tale”. At less than 12 minutes, it lacks the time to explore the film’s creation in detail, and it suffers from the usual sense of promotion that comes with pieces of this sort. Nonetheless, we get some good insights, and it’s a blast to see the actors perform together. It’s not a great show, but it has enough going for it to become engaging. Top Ten Uses for Oversized Ears runs one minute, 21 seconds. It provides exactly what its title implies: a list of 10 ways to utilize enormous ears. It’s cute at best. Next we find an Interactive Map of the Kingdom of Dor. This allows us to wander through the castle of Dor and learn a bit more about it. A narrator tells us about the locations while we see images of them. None of these teach us anything you don’t already know from the movie. Two games appear. Despereaux’s Quest sends us through five mini-contests required to help Despereaux save the Princess. Some are very easy, some require some skill, and many some are annoying. I’ve seen worse, though we don’t get a unique reward for completion. Build a Boldo takes you to the kitchen to create the “magic soup genie”. It presents various fruits and vegetables and requires you to identify the ones needs to assemble Boldo. We can play at “easy” or “hard” levels, and the latter indeed seems tougher. Both are forgiving, though, so don’t expect much trouble. A few ads open the DVD. We get clips for Curious George 2: Follow That Monkey, The Tale of Despereaux video game, Pokemon: Giratina and the Sky Warrior, Barbie: Thumbelina and Bionicle: The Legend Reborn. No trailer for Despereaux appears. The disc also provides a 10-minute and 23-second sneak peek for Curious George 2. Don’t expect comments from those involved in the movie. Instead, it simply shows a sizable chunk of footage from the flick. Despite its “believe in yourself” message, The Tale of Despereaux provides a surprisingly dark, foreboding tale. That tone allows it to stand out from the crowd, and the rest of the film does enough right to create an interesting piece of work. The DVD provides excellent visuals and good audio but doesn’t include substantial extras. This would be fine entertainment for kids ages eight and up or so; despite the presence of the cute big-eared mouse, I don’t think it’s appropriate for littler ones.